Set up a two yard A rectangle 20yds long about 12yds wide. Place a disc in the center to make the center clear to the players. The yellow discs are approximately two yards wide. The green discs are there to serve as the staring point for each line. 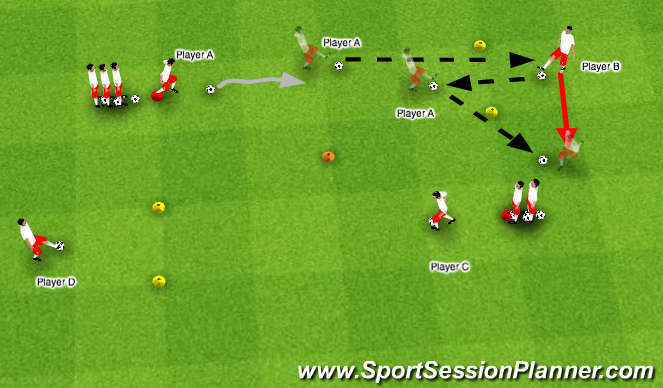 Exercise: Groups of 6 to 8 players with 4 to 6 balls per group. Rotation: Player A and Player C dribble with the ball for 10yds and then pass the ball through the gates, prior to reaching the central disc, to Player B and Player D. Player B and Player D receive the ball and dribble to the end of the closest line. Player A and C take up the positions previously occupied by players B and D.
• Running with ball (coach can make the field longer depending on ability level). • Passing accurately with inside of the foot (toe up, ankle locked). • Passing accurately with laces or outside of foot (more advanced technique). • Receiving the ball (on your toes, soft on your feet, first touch should take you in the direction you want to go next). Variation: Change direction of the circuit, ask players to play with their left foot, ask players to receive the ball with various parts of foot (outside is more difficult). 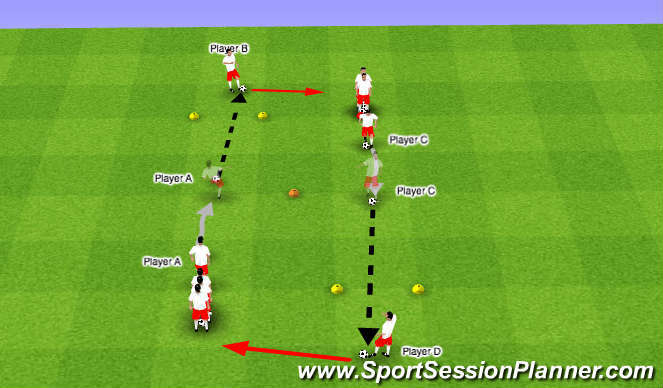 Player A dribbles 10yrs then passes the ball to Player B when he/she arrives at the center cone. Player B completes a drop pass for Player A to run onto, then Player A plays an angled ball into the space for player B to run onto.